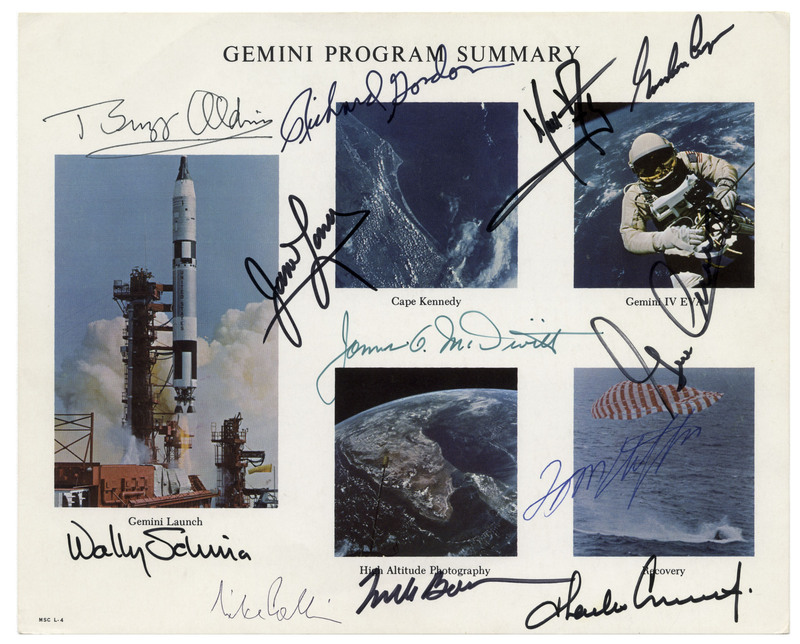 To auction, sell or consign a Gemini autograph from one of the Gemini astronauts, please email Nate@NateDSanders.com or call Nate D. Sanders at (310) 440-2982. Gemini autograph on a Gemini astronaut NASA photo collage. Paving the way for the Apollo program, Gemini missions first launched on 8 April 1964 and ended on 15 November 1966. Astronauts boldly sign their names in black, green and blue ink: ”Neil Armstrong”, ”Mike Collins”, ”Buzz Aldrin”, ”Richard Gordon”, ”Gordon Cooper”, ”James Lovell”, ”James G. McDivitt”, ”Gene Cernan”, ”Wally Schirra”, ”Charles Conrad”, ”Tom Stafford” and ”Frank Borman”. Verso includes a summary of the Gemini Program and captions for each photograph. Very minor creasing to corners, otherwise near fine condition. All signatures clean and striking. Sold for $6,250. Gemini 3 space-flown two-dollar bill signed by Gus Grissom and John Young. The first pair of Americans ever in space sign the currency: ”Gus Grissom / GT-3” and ”John Young / 3-23-65” in red felt tip. 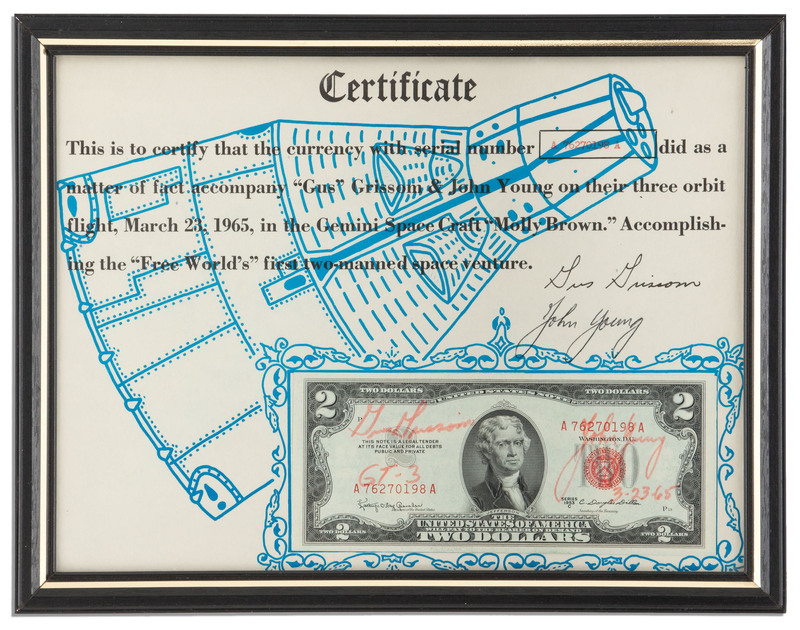 Signed bill comes mounted to a certificate that reads in full: ”This is to certify that the currency with serial number A76270198A did as a matter of fact accompany ‘Gus’ Grissom & John Young on their three orbit flight, March 23, 1965, in the Gemini Space Craft ‘Molly Brown.’ Accomplishing the ‘Free World’s’ first two-manned space venture / [signed] Gus Grissom / John Young”. The signed bills were at the center of a prank, told in full in Russell Still’s book, ”Relics of the Space Race”; Grissom reportedly moved the bills from their hiding place behind the instrument panel and substituted play money so that when the launch supervisor in charge of the flown souvenirs went to retrieve them, he found the play money instead. The truth came out after a few weeks and the bills were given out to Cape Canaveral personnel. Series 1953C $2 bill is near fine and comes mounted to a 10” x 7.5” COA, also near fine, framed to an overall size of 11” x 8.5”. Sold for $3,750. 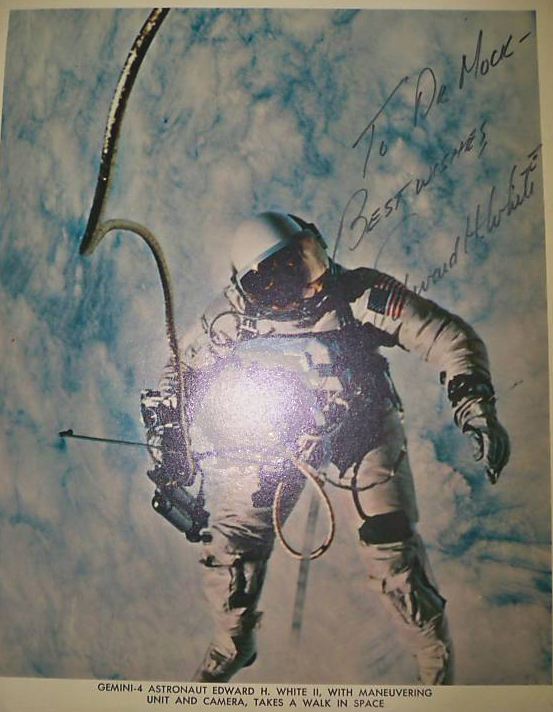 Gemini autograph of astronaut Edward H. White signed space walk photo. Boldly signed and inscribed in black ink to a doctor in the space program, “To Dr. Mock / Best Wishes / Edward H. White.” Photo text reads: “Gemini-4 Astronaut Edward H. White II, With Maneuvering Unit and Camera, Takes a Walk in Space.” Image measures 8″ x 10″. Slight foxing to edges, otherwise excellent condition. Sold for $1,074. Gemini 4 Astronaut Edward H. White signed space walk photo.